April 1, 2005 – Chaotic Wrestling: “Intellectual” Arch Kincaid w/Tommy Penmanship defeated Dr. Reginald Hersey. ~~~Later in the night: Fred “Bonecrusher” Sampson defeated Tommy Penmanship w/Arch Kinciad. May 6, 2005 – Chaotic Wrestling: Bryan and Matt Logan and Nick Logan beat Arch Kincaid and Tommy Penmanship and Max Bower. June 24, 2005 – Chaotic Wrestling: Bryan and Matt Logan defeated Arch Kincaid and Tommy Penmanship. July 14, 2005 – SmackDown! : Tommy Penmanship appeared on SmackDown! playing the annorny of Muhammad Hassan. ~~~As “Thomas Whitney”, he read a statement from Hassan and then got chokeslammed and tombstoned by Undertaker! July 15, 2005 – Chaotic Wrestling: Arch Kincaid and Tommy Penmanship and Max Bauer defeated The Logan Brothers. August 17, 2005 – IWF: Chase del Monte won four-way over Tommy Penmanship and Rob Morrison and Nick Sabre. October 1, 2005 – Chaotic Wrestling: Chase del Monte defeated Thomas Penmanship by Count Out. November 3, 2005 – Deep South Wrestling: Arch Kincaid and Tommy Penmanship defeated The Slaughter Boys. November 11, 2005 – Chaotic Wrestling: Thomas Penmanship defeated Chase Del Monte in a ladder match. December 3, 2005 – ECWA: Japanese Pool Boy defeated Thomas Penmanship. January 6, 2006 – Chaotic Wrestling: Thomas Penmanship defeated Jason Blade | Thomas Psycho defeated Penmanship. April 15, 2006 – Big Time Wrestling: Jeto (Shinsuake Yamagasa) beat Thomas Penmanship and Frankie Arion in a 3-WAY. June 10, 2006 – Defiant Pro Wrestling: Thomas Penmanship defeated Psycho. September 8, 2006 – Chaotic Wrestling: Thomas Penmanship defeated Chase Del Monte to retain the Chaotic Heavyweight title. September 29, 2006 – Chaotic Wrestling: Thomas Penmanship defeated Handsome Johnny to retain the Chaotic Heavyweight title. October 20, 2006 – Chaotic Wrestling: Thomas Penmanship vs Pride (Dan Freitas and Brian Nunes) was ruled a no contest. November 3, 2006 – ROH: Titus and Bobby Dempsey and Mitch Franklin defeated Alex Payne and Ernie Osirus and Thomas Penmanship. December 1, 2006 – Chaotic Wrestling: Thomas Penmanship defeated Max Bauer to retain the Chaotic Wrestling title..
December 16, 2006 – EPW: Scott Ashworth and D.J. Baron defeated Thomas Penmanship and Max Bauer to retain the tag team titles. January 12, 2007 – CW: Thomas Penmanship and Jason Blade and Kid Mikaze vs Brian Milonas and Max Bauer and Alex Arion ended in a no contest. February 21, 2007 – OVW TV Tapings: Tomasso defeated T.J. Dalton in a dark match. March 7, 2007 – OVW TV Tapings: Tomasso defeated Jamin Olavencia. March 14, 2007 – OVW TV Tapings: Tomasso defeated Vic D. Vine in a dark match. March 21, 2007 – OVW TV Tapings: Tomasso defeated Ramon Loco in a dark match. March 24, 2007 – Ohio Valley Wrestling: K.C. James defeated Tomasso. March 28, 2007 – OVW TV Tapings: Shawn Spears defeated Tomasso. April 11, 2007 – OVW TV Tapings: Tomasso defeated Kassidy James in a dark match. April 11, 2007 – OVW TV Tapings: Mike Mondo defeated Tomasso in a match shown on OVW Television. April 18, 2007 – OVW TV Tapings: Tomasso defeated [INSERT] in a dark match. April 21, 2007 – Ohio Valley Wrestling: Tomasso defeated Alexander. June 27, 2007 – OVW TV Tapings : Prodigy defeated Mike Mondo in a dark match. July 14, 2007 – Ohio Valley Wrestling: Nick Nemeth defeated Prodigy. July 18, 2007 – OVW TV Tapings: Prodigy participated in a Royal Rumble for the right to face John Cena on 7/27. July 21, 2007 – Ohio Valley Wrestling: The Major Brothers defeated Tommaso and Justin “The Ox” LaRoche. July 25, 2007 – OVW TV Tapings: Colt Cabana defeated Prodigy in a dark match. July 28, 2007 – Ohio Valley Wrestling (Afternoon): JTG defeated Prodigy. July 28, 2007 – Ohio Valley Wrestling (Night): Armando Alejandro Estrada defeated Prodigy. August 3, 2007 – OVW Six Flags: Mike Mondo defeated Prodigy. August 9, 2007: Tommasso Whitney was released from his WWE developmental contract. September 29, 2007 – MWF: Tommaso Ciampa defeated A.J. Styles and Eddie Edwards in a 3-WAY to win the Television title. October 27, 2007 – Millennium Wrestling Federation: Tommaso Ciampa beat Eddie Edwards to retain the MWF Television title. November 24, 2007 – Millennium Wrestling Federation: Jay Lethal beat Tommaso Ciampa by disqualification in Somerville, Massachusetts. February 23, 2008 – East Coast Championship Wrestling: Tommaso Ciampa beat Chase Del Monte and Don Vega in a 3-WAY. ~~~Big Rick Fuller beat Bonecrusher Fred Sampson and Tommaso Ciampa in a 3-WAY to win the ECCW Triple Threat championship. March 14, 2008 – CW: Thomas Penmanship defeated Franciz. April 4, 2008 – CW: CW heavyweight champion Bryan Logan vs. Thomas Penmanship ended in a time limit draw. Bryan Logan retains the title. April 20, 2008 – The Way Wrestling Was: The Lebanese Prince” Jaleel Salaam (w/Marshall McNeil) defeated Tomasso Ciampa. April 25, 2008 – CW: Thomas Penmanship defeated Sledge by disqualification. April 26, 2008 – PHW: Josh Daniels defeated Tommaso Ciampa. May 15, 2008 – CW: Tommaso Ciampa defeated Brian Milonas in a Unsanctioned match. June 6, 2008 – CW: Matt Logan defeated Tommaso Ciampa. June 21, 2008 – Millenium Wrestling Federation: Jay Lethal beat Tommaso Ciampa in a Lumberjack match to win the TV title. June 21, 2008 – Millenium Wrestling Federation: Brian Fury defeated Tommaso Ciampa. June 27, 2008 – CW: CW heavyweight champion Alex Arion defeated Tommaso Ciampa to retain the title. September 19, 2009 – WLW: Bobby Fish defeated Tommaso Ciampa. October 4, 2008 – WLW: Dinn T. Moore and Tommaso Ciampa defeated Brian Breaker and Darin Waid. Tommaso Ciampa was in a 9 man battle royal to determine the new WLW heavyweight title won by Go Shiozaki. October 17, 2008 – WLW: Brian Breaker and Dinn T. Moore defeated Tommaso Ciampa and Tony Raze. October 18, 2008 – WLW: Marc Godeker and Tommaso Ciampa defeated Brian Breaker and Dinn T. Moore. October 24, 2008 – WLW: Ricky Steamboat Jr. defeated Tommaso Ciampa and Darin Waid in a 3-way match. November 22, 2008 – WLW: WLW tag team champions Dinn T. Moore and Brian Breaker defeated Tommaso Ciampa and Steve Anthony to retain the titles. November 29, 2008 – WLW: Dinn T. Moore defeated Tommaso Ciampa. December 20, 2008 – OVW TV: OVW TV champion Outlaw defeated Tommaso to retain. December 27, 2008 – NWA on Fire: Tommaso Ciampa defeated Big John. December 28, 2008 – NWA on Fire: Tommaso Ciampa defeated Jason Rumble. January 9, 2009 – CW: Tommaso Ciampa defeated Don Chesterfield. February 6, 2009 – CW: Don Chesterfield and Duchess Damon defeated Tommaso Ciampa and Max Bauer. February 7, 2009 – NWA on Fire: Apolo defeated Tommaso Ciampa. February 8, 2009 – NWA on Fire: Tommaso Ciampa defeated Sonny Roselli. February 20, 2009 – CW: Max Bauer and Tommaso Ciampa defeated Don Chesterfield and Duchess Damon. March 6, 2009 – CW: Tommaso Ciampa defeated Brandon Locke. March 18, 2009 – CW: Antonio T and Danny E defeated Tommaso Ciampa and Max Bauer. March 21, 2009 – WLW: WLW tag team champions Darin Waid and Dustin Lane defeated Tommaso Ciampa and Marc Godeker to retain the titles. April 3, 2009 – CW: CW tag team champions Mikaze and Brian Fury defeated Tommaso Ciampa and Max Bauer & Danny E and Duchess Damon in a 3-way tag team match to retain. April 24, 2009 – CW: Dr. Reginald Heresy and Orlin Goodspeed III defeated Tommaso Ciampa and Max Bauer. April 25, 2009 – CW: Tommaso Ciampa defeated Antonio T.
May 1, 2009 – CW: Tommaso Ciampa and Max Bauer defeated Dr. Reginald Heresy and Orlin Goodspeed III. August 30, 2009 – TRP: Tommaso Ciampa defeated Jimmy Preston. September 12, 2009 – CTWA: Colt Cabana defeated Tommaso Ciampa. September 18, 2009 – TRP: Tommaso Ciampa vs. Jason Blade ended in a time limit draw. September 21, 2009 – NWA on Fire: Antoine Roy defeated Tommaso Ciampa. October 10, 2009 – ECWA: Tommaso Ciampa defeated Mike Tobin in the 1st round. Tommaso Ciampa defeated Dan Eckos in the semi-finals. Nick Logan defeated Tommaso Ciampa to win the ECWA tournament. October 16, 2009 – CW: Nick Logan defeated Tommaso Ciampa. November 6, 2009 – TRP: Tomasso Ciampa vs. Jason Blade ended in a double count-out in the 3rd fall of a 2/3 Falls match. November 13, 2009 – Northeast Wrestling: Jim Neidhart and The NOW beat Bob Evans and Rob Eckos and Thomas Ciampa in Connecticut. November 21, 2009 – TRP: Tommaso Ciampa defeated Matt Taven. December 7, 2009 – ROH TV (Taped): Tommaso Ciampa and Gino Giovanni defeated The Bravado Brothers in a dark match. December 11, 2009 – CW: Tommaso Ciampa defeated Mark Bourne. January 1, 2010 – TRP: Tommaso Ciampa defeated Jason Blade in a last man standing match. January 8, 2010 – CW: Tommaso Ciampa and Max Bauer defeated Mark Bourne and Chase Del Monte. March 12, 2010 – NEW: Jason Blade defeated Tommaso Ciampa. April 9, 2010 – Top Rope Promotions: Tommaso Ciampa defeated Spike Dudley in an Open Challenge match. April 10, 2010 – CW: Tommaso Ciampa and Max Bauer defeated Demon Ortiz and Makimaze. April 24, 2010 – Millenium Wrestling Federation: MWF TV champion Brian Fury beat Tommaso Ciampa and Scott Reed in a 3-WAY. April 30, 2010 – CW: Tommaso Ciampa defeated Rick Fuller by count-out. May 14, 2010 – TRP: Tommaso Ciampa defeated Eric Alden. May 29, 2010 – FTW: Joey Ace defeated Tommaso Ciampa. June 4, 2010 – TRP: Tommaso Ciampa defeated Romeo Roselli. June 5, 2010 – PWF: Christopher Daniels defeated Tommaso Ciampa, EJ Risk, Judas Young and Tommy Mack in a 6-way elimination match. June 11, 2010 – CW: CW New England champion Julian Starr defeated Tommaso Ciampa to retain the title. June 18, 2010 – CW: Alex Arion defeated Tommaso Ciampa. July 10, 2010 – ECWA Super 8 Tournament: Tommaso Ciampa defeated Chase Del Monte in a 1st Round match. ~~~Tommaso Ciampa beat Chris Wylde (2nd Round) | Austin “Consequences” Creed beat Tommaso Ciampa (Finals). July 16, 2010 – CW: Tommaso Ciampa defeated Scotty Charisma. July 17, 2010 – TRP: Tommaso Ciampa defeated Lukas Sharp. July 24, 2010 – DGUSA: Cheech and Cloudy defeated Tommaso Ciampa and Bobby Shields in a dark match. July 31, 2010 – Maryland Championship Wrestling: Tommaso Ciampa defeated Bobby Shields the 1st Round of the Shamrock Cup. Christian York defeated Tommaso Ciampa, Rich Swann, Ryan McBride, Sami Callihan and Teddy Stigma in a 6-way final match for the Shane Shamrock Cup. August 13, 2010 – CW: CW heavyweight champion Brian Milonas defeated Tommaso Ciampa to retain the title. September 26, 2010 – TRP: Tommaso Ciampa defeated Shane Alden. October 1, 2010 – CW: Tommaso Ciampa defeated Matt Spectro. October 8, 2010 – TRP: Vinny Marseglia defeated Tommaso Ciampa by disqualification. October 16, 2010 – CZW: BLK Jeez defeated Tommaso Ciampa. October 22, 2010 – CW: CW heavyweight champion Mikaze defeated Tommaso Ciampa to retain the title. October 23, 2010 – FTW: Tommaso Ciampa defeated Earl Cooter. October 29, 2010 – DGUSA: Sami Callihan defeated Tommaso Ciampa, Caleb Konley, Cheech, Rip Impact, Shane Smalls and Silas Young in a 7-way dark match. November 13, 2010 – CZW: Tommaso Ciampa defeated Scott Reed in a dark match. November 20, 2010 – FTW: Tommaso Ciampa defeated Grim Reefer. December 3, 2010 – TRP: Tommaso Ciampa won a heavyweight title battle royal to win the vacant heavyweight title. December 4, 2010 – ECWA: Tommaso Ciampa defeated Damian Dragon. January 1, 2011 – TRP: TRP heavyweight champion Tommaso Ciampa defeated Vinny Marseglia to retain the title. January 15, 2011 – NEW Wrestlefest: Hale Collins defeated Tommaso Ciampa, Sabu, Ryan McBride and Vik Dalishus in a 5-way ladder #1 contender match for the heavyweight title. February 11, 2011 – CW: Tommaso Ciampa won a battle royal. February 18, 2011 – TRP: Tommao Ciampa, Guy Alexander and Matt Magnum defeated Matt Taven, Vinny Marseglia and Mike Bennett. February 19, 2011 – TRP: Matt Taven and Vinny Marseglia defeated Tommaco Ciampa and Robbie E.
February 20, 2011 – TRP: TRP heavyweight champion Tommaso Ciampa defeated Vinny Marseglia to retain the title. March 4, 2011 – CW: CW heavyweight champion Brian Milonas defeated Tommaso Ciampa to retain the title. March 13, 2011 – ROH TV: Tommaso Ciampa defeated Mike Sydal. March 17, 2011 – ROH Defy or Deny: Tommaso Ciampa defeated Adam Cole. March 18, 2011 – ROH Manhattan Mayhem: Tommaso Ciampa defeated Grizzly Redwood. March 25, 2011 – CW: CW New England champion Max Bauer defeated Tommaso Ciampa to retain the title. March 26, 2011 – NEW: Brian Anthony defeated Tommaso Ciampa. April 1, 2011 – ROH Honor take Stage night 1: Homicide defeated Colt Cabana, Tommaso Ciampa and Caleb Konley in a 4-way match. April 2, 2011 – ROH Honor take Stage night 2: Tomasso Ciampa defeated Homicide. April 8, 2011 – TRP: TRP heavyweight champion Tommaso Ciampa defeated Matt Taven to retain the title. April 30, 2011 – ECWA: Tommaso Ciampa defeated Rich Swann in the 1st round. Tommaso Ciampa defeated Shiima Xion in the semi-finals. Tommaso Ciampa defeated Adam Cole to win the ECWA 15th annual tournament. May 6, 2011 – ROH Revolution: Tommaso Ciampa defeated Homicide. May 7, 2011 – ROH Revolution: Michael Elgin defeated Tommaso Ciampa, Adam Cole, Andy Ridge, Grizzly Redwood and Rhett Titus in a double danger scramble. May 13, 2011 – FTW: Wes Draven defeated Tommaso Ciampa. June 3, 2011 – CW: Tommaso Ciampa defeated Kongo. June 5, 2011 – 2CW: Isis Ephex defeated Tommaso Ciampa. June 10, 2011 – TRP: Matt Taven defeated TRP heavyweight champion Tommaso Ciampa by disqualification. June 11, 2011 – NEW: Tommaso Ciampa defeated Danny Eckos. June 17, 2011 – C4: Sebastian Suave defeated Tommaso Ciampa, Mike Rollins and Brent B in a 4-way match. June 26, 2011 – ROH Best in the World: Tommaso Ciampa w/Prince Nana and Ernesto Osiris defeated Colt Cabana. July 15, 2011 – CW: CW heavyweight champion Handsome Johnny defeated Tommaso Ciampa to retain the title. July 16, 2011 – Wrestlejam 7: Bobby Fish defeated Tommaso Ciampa. July 23, 2011 – FTW: Grim Reefer defeated Tommaso Ciampa in a submission match. August 5, 2011 – TRP: Matt Taven defeated Tommaso Ciampa to win the TRP heavyweight title in a street fight. September 9, 2011-CW: John Walters defeated Tommaso Ciampa. September 16, 2011 – 2CW: Isis Ephex defeated Tommaso Ciampa. September 17, 2011 – ROH Death before Dishonor: Tommaso Ciampa and Rhino with the Embassy defeated Homicide and Jay Lethal. September 24, 2011 – ECWA: ECWA heavyweight champion Papadon defeated Tommaso Ciampa to retain the title. September 30, 2011 – NEW: Finlay defeated Tommaso Ciampa. October 21, 2011 – CW: Tommaso Ciampa defeated Julian Starr. October 29, 2011 – ROH TV: Tommaso Ciampa defeated Alex Silva. November 6, 2011 – ROH Gateway to Honor: Tommaso Ciampa defeated Andy Ridge. November 11, 2011 – 2CW: Cheech defeated Tommaso Ciampa in the 1st round. November 12, 2011 – 2CW: Tommaso Ciampa defeated Ricky Reyes. November 18, 2011 – ROH Survival of the Fittest: Michael Elgin defeated Kenny King, Adam Cole and Tommaso Ciampa. November 19, 2011 – ROH Glory by Honor: Tommaso Ciampa vs. Jimmy Jacobs ended in a no contest. Tommaso Ciampa defeated Harlem Bravado. December 2, 2011 – CW: Matt Taven defeated Tommaso Ciampa. December 3, 2011 – ROH TV: Tommaso Ciampa defeated Shiloh Jonze. December 10, 2011 – XWA: Jason Blade defeated Tommaso Ciampa with Mick Foley as the special referee. December 23, 2011 – ROH Final Battle: Tommaso Ciampa w/The Embassy defeated Jimmy Rave. January 20, 2012 – ROH Homecoming: Tommaso Ciampa defeated Grizzly Redwood, Andy “Right Leg” Ridge, Mike Bennett in a 4 corners match. January 21, 2012 – ROH Underground: Tommaso Ciampa defeated Jay Lethal. January 27, 2012 – CW: Tommaso Ciampa defeated Taka Suzuki. January 28, 2012 – ROH TV: Tommaso Ciampa defeated TJ Perkins. February 24, 2012 – CW: Tommaso Ciampa defeated Matt Taven. March 3, 2012 – ROH TV: Tommaso Ciampa defeated Guy Alexander. March 4, 2012 – ROH 10th Anniversary: World TV Champion Jay Lethal defeated Tommaso Ciampa with The Embassy Ltd.
March 30, 2012 – Showdown in the Sun night 2: Tommaso Ciampa w/ The Embassy defeated Cedric Alexander w/ Caprice Coleman. March 31, 2012 – ROH TV: Tommaso Ciampa defeated Kyle O’Reilly to advance March Mayhem” Qualifier. April 7, 2012 – ROH TV: Tommaso Ciampa beat Adam Cole, “The Prodigy” Mike Bennett, and Jay Lethal to win the $24,000 March Mayhem 4 Way Elimination Finals. April 20, 2012 – CW: Tommaso Ciampa defeated Chase Del Monte. May 5, 2012 – ROH TV: Tommaso Ciampa defeated Matt Taven. May 12, 2012 – ROH Border Wars: Jay Lethal defeated Tommaso Ciampa w/ The Embassy, Ltd.
May 26, 2012 – ROH TV: Jay Lethal vs Tommaso Ciampa ended in a time limit draw. June 1, 2012 – NEW: Bobby Lashley defeated Tommaso Ciampa. June 2, 2012 – NEW Live Event: Matt Taven defeated Tommaso Ciampa. June 2, 2012 – ROH TV (Taped): Tommaso Ciampa defeated Nick Westgate. June 16, 2012 – ROH TV: Roderick Strong defeated Tommaso Ciampa via disqualification to retain the TV Title. June 22, 2012 – CW: CW heavyweight champion Brian Fury defeated Tommaso Ciampa to retain the title. June 23, 2012 – 2CW: Rhino defeated Tommaso Ciampa. June 24, 2012 – ROH Best in the World: ROH TV Champion Roderick Strong defeated Jay Lethal and Tommaso Ciampa in a 3-way match to retain. June 30, 2012 – ROH Live Strong: Eddie Edwards defeated Tommaso Ciampa. July 28, 2012 – ROH TV: Tommaso Ciampa defeated Mike Sydal. August 4, 2012 – 2CW: Tommaso Ciampa defeated Sami Callihan. August 11, 2012 – ROH Boiling Point: Jay Lethal defeated Tommaso Ciampa in a 2 out 3 falls count match. During the match Ciampa tore his anterior cruciate ligament sidelining him indefinitely from in-ring action. On September 7, Ciampa announced that his injury required surgery, which would sideline him for a year. August 25, 2012 – ROH TV: Mike Mondo beat TJ Perkins, Tommaso Ciampa, Roderick Strong, Jay Lethal, and Mike Bennett to earn the “DBD X” TV Title match. September 8, 2012 – ROH TV (Taped): Tommaso Ciampa defeated Mike Posey. May 3, 2013 – CW: Tommaso Ciampa defeated Danny E.
May 4, 2013 – ROH Border Wars: Tommaso Ciampa returned from his injury chasing RD Evans and QT Marshall out of the ring. May 11, 2013 – ROH TV: Tommaso Ciampa defeated Vinny Marseglia. May 17, 2013 – XWA: Tommaso Ciampa and Jason Blade defeated Ricky Reyes and Kristian Frost. May 18, 2013 – ROH Relentless Tommaso Ciampa defeated Chris LaRusso. June 1, 2013 – ECWA: ECWA heavyweight champion VSK defeated Tommaso Ciampa and Josh Daniels in 3-way match to retain the title. June 7, 2013 – CW: Tommaso Ciampa defeated Matt Taven. June 8, 2013 – ROH TV: Tommaso Ciampa defeated Rip Impact. June 22, 2013 – ROH Best in the World: Michael Elgin defeated Tomasso Ciampa. June 29, 2013 – PWX: Brian Fury defeated Tommaso Ciampa in a 1st round match. July 12, 2013 – ROH Reclamation Night 1: Tommasso Ciampa defeated Rhino. July 13, 2013 – ROH Reclamation Night 2: Silas Young defeated Tommaso Ciampa. July 13, 2013 – ROH TV (Taped): Tommaso Ciampa defeated QT Marshall. July 20, 2013 – PWX: Cedric Alexander defeated Tommaso Ciampa. August 3, 2013 – ROH Extravaganza: Tommaso Ciampa defeated Silas Young in the 1st round of the WHC Title tournament. August 10, 2013 – ROH TV: Tommaso Ciampa, Kevin Steen and Michael Elgin defeated BJ Whitmer, Davey Richards and Eddie Edwards. August 11, 2013 – WIA: Drew Gulak defeated Tommaso Ciampa. August 16, 2013 – CW: Slyck Wagner Brown defeated Tommaso Ciampa. August 17, 2013 – ROH Mayhem Manhattan: Tommaso Ciampa defeated Michael Bennett in the Tournament Quarter Finals. August 30, 2013 – PWG Battle of Los Angeles: Brian Cage defeated Tommaso Ciampa in the 1st round. August 31, 2013 – PWG Battle of Los Angeles: Chuck Taylor, Joey Ryan and Trent Baretta defeated Tommaso Ciampa, B-Boy and Willie Mack. September 6, 2013 – ROH Road to Greatness: Kevin Steen and Michael Elgin defeated Tommaso Ciampa and Adam Cole. September 7, 2013 – ROH Road to Greatness: Tommaso Ciampa defeated Luke Hawx. September 14, 2013 – ICW: Ricky Reyes defeated Tommaso Ciampa. September 20, 2013 – ROH Death Before Dishonor: Adam Cole defeated Tommaso Ciampa in the semi-finals of the ROH world title tournament. October 19, 2013 – PWG: Drake Younger defeated Tommaso Ciampa, Brian Cage and Anthony Nese in a 4-way match. October 26, 2013 – ROH Glory by Honor: Tommaso Ciampa defeated Jesse Sorensen. November 1, 2013 – CW: Biff Busick defeated Tommaso Ciampa. November 2, 2013 – ROH The Golden Dream: Tommaso Ciampa defeated Jay Lethal and Mark Briscoe in a 3-way match to become #1 contender at the TV title. November 16 2013 – ROH Tag Pursuit: Tommaso Ciampa defeated Mark Briscoe. November 17, 2013 – Beyond Wrestling: Chris Dickinson defeated Tommaso Ciampa. November 22, 2013 – XWA: Tommaso Ciampa defeated Biff Busick. December 6, 2013 – LPW: Anthony Stone and Nick Wesgate defeated Tommaso Ciampa and Matt Magnum. December 13, 2013 – CW: Mikey Webb defeated Tommaso Ciampa. Psycho defeated Tommaso Ciampa. December 14, 2013 – ROH Final Battle: Tommaso Ciampa defeated Matt Taven to win the ROH TV title. December 20, 2013 – PWG: Drake Younger defeated Tommaso Ciampa. December 21, 2013 – PWG: Tommaso Ciampa defeated Anthony Nese. January 17, 2014 – CW: Scotty Slade defeated Tommaso Ciampa. January 18, 2014 – ROH TV (Taped): ROH TV champion Tommaso Ciampa defeated Silas Young to retain the title. January 18, 2014 – XWA: Tommaso Ciampa and Eddie Edwards defeated Ricochet and Uhaa Nation. January 25, 2014 – ROH Wrestling’s Finest: ROH TV champion Tommaso Ciampa defeated Jay Lethal and Matt Taven in a 3-way match to retain the title. January 31, 2014 – PWG: Tommaso Ciampa defeated Adam Thornstowe. February 7, 2014 – CW: Thomas Penmanship defeated Vern Vicallo. February 8, 2014 – ROH State of the Art: Kevin Steen defeated Tommaso Ciampa, Jay Lethal and Michael Elgin in a 4-way match to become #1 contender for the world title. February 16, 2014 – Beyond Wrestling: Tommaso Ciampa and Michael Elgin defeated Jaka and Chris Dickinson by disqualification. February 21, 2014 – ROH 12th Year Anniversary Show: ROH TV champion Tommaso Ciampa defeated Hanson to retain the title. February 28, 2014 – wXw: ROH TV champion Tommaso Ciampa defeated Freddy Stahl to retain the title. March 1, 2014 – PCW: Martin Kirby defeated Noam Dar, Rob Bell and Tommaso Ciampa in a 4-way match. ROH TV champion Tommaso Ciampa defeated Martin Kirby to retain the title. March 2, 2014 – SWE: ROH TV champion Tommaso Ciampa defeated Kris Travis to retain the title. March 8, 2014 – Kamikaze Pro: ROH TV champion Tommaso Ciampa defeated Eddie Dennis to retain the title. March 9, 2014 – SWE: Johnny Gargano vs. Tommaso Ciampa ended in a time limit draw. Joseph Connors defeated Tommaso Ciampa. March 15, 2014 – ROH TV (Taped): ROH TV champion Tommaso Ciampa defeated Jay Lethal to retain the title. March 15, 2014 – wXw: Jon Ryan defeated Carnage, Michael Dante and Tommaso Ciampa in a 4-way match. March 16, 2014 – wXw: Miguel Ramirez defeated Da Mack, John Klinge, Johnny Gargano, Karsten Beck and Tommaso Ciampa in a 6-way match. March 21, 2014 – CW: Tommaso Ciampa won a chaotic countdown. March 22, 2014 – ROH Flyin’ High: ROH TV champion Tommaso Ciampa defeated Matt Taven to retain the title. April 4, 2014 – ROH Supercard of Honor VIII: Jay Lethal defeated ROH TV champion Tommaso Ciampa to win the title. April 11, 2014 – CW: Mark Shurman, Scotty Slade and Tommaso Ciampa defeated Brian Fury, Matt Taven and Vinny Marseglia. April 19, 2014 – TRP: Mark Shurman, Scotty Slade and Tommaso Ciampa defeated Biff Busick, Gregory Edwards and Hanson. April 25, 2014 – CW: Thomas Penmanship defeated Vinny Marseglia. May 3, 2014 – ROH TV (Taped): Tommaso Ciampa defeated Roderick Strong. May 3, 2014 – NEW: Matt Taven defeated Tommaso Ciampa. May 10, 2014 – ROH/NJPW Global Wars: ROH TV champion Jay Lethal defeated Tommaso Ciampa, Matt Taven and Silas Young in a 4-way match to retain the title. May 16, 2014 – CW: Thomas Penmanship defeated Jimmy Preston. May 17, 2014 – ROH/New Japan War of the Worlds: Tommaso Ciampa, Matt Taven and ACH defeated Rocky Romero, Alex Koslov and Takaaki Watanabe. May 18, 2014 – Beyond Wrestling: Tommaso Ciampa defeated Jaka. May 24, 2014 – XWA: Tommaso Ciampa defeated Jay Lethal. May 30, 2014 – CW: Brian Milonas vs. Thomas Penmanship ended in a no contest. June 6, 2014 – ROH Road to Best in the World: Tommaso Ciampa defeated Ethan Page. June 7, 2014 – ROH Road to Best in the World: ROH champion Adam Cole defeated Tommaso Ciampa to retain the title. June 13, 2014 – APW: Joey Ryan and Tommaso Ciampa defeated Idris Jackson and Jonny Yen. June 14, 2014 – HOH: Joey Ryan defeated Tommaso Ciampa. June 21, 2014 – XWA: Tommaso Ciampa defeated Eddie Edwards. June 22, 2014 – ROH Best in the World: ACH defeated BJ Whitmer, Caprice Coleman, Tadarius Thomas, Takaaki Watanabe and Tommaso Ciampa in a 6-way match to become #1 contender for the ROH TV title. June 28, 2014 – NEW: Davey Richards defeated Tommaso Ciampa. July 12, 2014 – ROH Summer Heat Tour: Kevin Steen defeated Tommaso Ciampa. July 18, 2014 – ROH Summer Heat Tour: ROH tag team champions Kyle O’Reilly and Bobby Fish defeated Tommaso Ciampa and Rocky Romero to retain the titles. July 26, 2014 – PWG: Tommaso Ciampa defeated Rocky Romero. August 1, 2014 – WPW: Tommaso Ciampa defeated Geeko Suave. August 8, 2014 – IWE: Scott Wild defeated Tommaso Ciampa. August 9, 2014 – ROH TV (Taped): Tommaso Ciampa defeated Adam Page. August 9, 2014 – ROH Summer Heat Tour: Rocky Romero defeated Tommaso Ciampa. August 15, 2014 – ROH Field of Honor: Silas Young defeated Tommaso Ciampa. August 22, 2014 – ROH Death Before Dishonor Night 1: Tommaso Ciampa defeated Jimmy Jacobs. August 23, 2014 – ROH Death Before Dishonor Night 2: ROH champion Michael Elgin defeated Tommaso Ciampa to retain the title. August 29, 2014 – PWG: Michael Elgin defeated Tommaso Ciampa in the 1st round. September 12, 2014 – AAW: Johnny Gargano defeated Tommaso Ciampa. September 13, 2014 – DREAMWAVE: Shane Hollister defeated Tommaso Ciampa. September 19, 2014 – NEW: Mike Bennett defeated Tommaso Ciampa and Biff Busick in a 3-way match. September 20, 2014 – XWA: Tommaso Ciampa defeated Antonio Atama and David Starr in a 3-way match to win the XWA title. October 4, 2014 – VOW: Facade defeated Tommaso Ciampa. ROH Michael Bennett’s Bachelor Party Hosted By Adam Cole: Tommaso Ciampa vs. Cheeseburger ended in a no contest. Tommaso Ciampa defeated Delirious. October 11, 2014 – ROH Champions vs. All Stars: Jay Briscoe, Jay Lethal, Kyle O’Reilly and Bobby Fish defeated ACH, Adam Cole, Roderick Strong and Tommaso Ciampa. October 17, 2014 – PWG: Tommaso Ciampa defeated Biff Busick. October 18, 2014 – PGP: PGP champion Ruff Crossing defeated Tommaso Ciampa to retain. October 31, 2014 – SPW: Marcello Spade defeated Tommaso Ciampa. November 7, 2014 – ROH Survival of the Fittest Night 1: Tommaso Ciampa defeated Will Ferrera to qualify for the Survival of the Fittest. November 8, 2014 – ROH Survival of the Fittest Night 2: Adam Cole defeated Adam Page, Hanson, Matt Sydal, Roderick Strong and Tommaso Ciampa in a 6-way elimination match to win the Survival of the Fittest. November 15, 2014 – ROH Glory by Honor: Tommaso Ciampa defeated The Romantic Touch. November 21, 2014 – XWA: XWA champion Tommaso Ciampa defeated Brian Fury to retain. November 22, 2014 – ROH Road to Final Battle: Tommaso Ciampa defeated Cedric Alexander in a no disqualification match. November 28, 2014 – ROH-PCW Super Show #1: Tommaso Ciampa defeated Uhaa Nation. November 29, 2014 – ROH-PCW Super Show #2: Uhaa Nation defeated BJ Whitmer, El Ligero and Tommaso Ciampa in a 4-way match. November 29, 2014 – ROH-PCW Super Show #3: Tommaso Ciampa defeated El Ligero. November 30, 2014 – ROH-PCW Super Show #4: ROH world champion Jay Briscoe defeated Tommaso Ciampa to retain the title. December 5, 2014 – wXw: Axel Tischer defeated Tommaso Ciampa. December 6, 2014 – wXw: Uhaa Nation defeated Tommaso Ciampa to qualify for the wXw 16 carat gold 2015 tournament. December 7, 2014 – ROH Final Battle: Michael Elgin defeated Tommaso Ciampa. December 12, 2014 – PWG: Brian Cage defeated Biff Busick, Tommaso Ciampa and Uhaa Nation in a 4-way match. December 27, 2014 – 2CW: Tommaso Ciampa defeated Dalton Castle. January 10, 2015 – PGP: Tommaso Ciampa defeated Mario Crivello in the 1st round. Tommaso Ciampa defeated Justice Jones in the semi-finals. Blake Steel defeated Tommaso Ciampa to win the Ryan Buckley Memorial tournament. January 10, 2015 – ROH TV (Taped): Hanson vs. Tommaso Ciampa vs. Michael Elgin in 3-way #1 contenders match for the world title ended in a no contest. January 17, 2015 – XWA: XWA world champion Tommaso Ciampa defeated JT Dunn and Paul London in a 3-way match to retain the title. January 23, 2015 – IWF: IWF world champion Drew Galloway defeated Tommaso Ciampa to retain the title in the 1st round. January 30, 2015 – ROH Winter Warriors Tour: Tommaso Ciampa defeated Tyson Dux. January 31, 2015 – ROH Winter Warriors Tour: Tommaso Ciampa and Hanson defeated The Kingdom (Michael Bennett and Matt Taven). February 7, 2015 – DREAMWAVE: Moose defeated Tommaso Ciampa by DQ. February 14, 2015 – ROH TV (Taped): Tommaso Ciampa defeated Jimmy Jacobs. February 15, 2015 – HRW: Tommaso Ciampa vs. Moose ended in a no contest. February 21, 2015 – ROH Winter Warriors Tour: Hanson defeated Cedric Alexander, Jay Lethal, Michael Elgin, Tommaso Ciampa and Will Ferrara in a 6-way match. February 27, 2015 – PWG: Cedric Alexander defeated Tommaso Ciampa. March 1, 2015 – ROH 13th Year Anniversary Show: ROH world champion Jay Briscoe defeated Tommaso Ciampa, Hanson and Michael Elgin in a 4-way to retain the title. March 20, 2015 – SSW: Remi Wilkins defeated Tommaso Ciampa. March 27, 2015 – ROH Super Card of Honor: Matt Sydal defeated Andrew Everett, Caprice Coleman, Cedric Alexander, Moose and Tommaso Ciampa in a 6-way match. March 28, 2015 – Wrestlecon: The Dudley Boyz (Bubba Ray Dudley & D-Von Dudley), Big Ryck, Colt Cabana, Matt Sydal & Tommy Dreamer defeated Abyss, Brian Myers, Chris Hero, Drew Gulak, James Storm & Tommaso Ciampa. April 3, 2015 – PWG: ACH defeated Tommaso Ciampa. April 10, 2015 – AAW: Tommaso Ciampa defeated Tommy End. April 11, 2015 – DREAMWAVE: Chris Castro defeated Tommaso Ciampa. May 1, 2015 – AAW: Tommaso Ciampa defeated Davey Richards. May 2, 2015 – ROH TV (Taped): ROH TV champion Jay Lethal defeated Tommaso Ciampa to retain the title. May 23, 2015 – 4FW: 4FW heavyweight champion Douglas Williams defeated Tommaso Ciampa to retain the title. May 24, 2015 – Progress Chapter 19: Tommaso Ciampa defeated Damo O’Connor in the 1st round. Zack Sabre Jr. defeated Tommaso Ciampa in the quarter-finals. May 29, 2015 – wXw: wXw Shotgun champion Ilja Dragunov defeated Tommaso Ciampa to retain the title. May 31, 2015 – SWE: Mark Haskins defeated Tommaso Ciampa. June 13, 2015 – Chikara: Dasher Hatfield defeated Tommaso Ciampa. June 19, 2015 – AAW: Tommaso Ciampa defeated Eddie Kingston. June 20, 2015 – ESW: Johnny Gargano defeated Tommaso Ciampa. June 26, 2015 – PWG: Tommaso Ciampa defeated Johnny Gargano. June 28, 2015 – HRW: Tommaso Ciampa defeated Matt Winchester. July 9, 2015 – GFW: Nick Aldis defeated Tommaso Ciampa. July 10, 2015 – Tier 1: Luke Hawx defeated Mike Bailey, Rude Boy Riley and Tommaso Ciampa in a 4-way elimination match to win the vacant Tier 1 title. July 11, 2015 – DREAMWAVE: Tommaso Ciampa defeated Bucky Collins. July 12, 2015 – PWX: Anthony Henry defeated Tommaso Ciampa. July 18, 2015 – HOH IX: Tommaso Ciampa defeated Eddie Kingston. July 24, 2015 – PWG: Trevor Lee defeated Tommaso Ciampa. August 1, 2015 – DREAMWAVE: DREAMWAVE world champion Marshe Rockett defeated Tommaso Ciampa to retain the title. August 9, 2015 – AAW: Silas Young defeated Tommaso Ciampa. August 16, 2015 – PWX: Tommaso Ciampa defeated Anthony Henry by DQ. 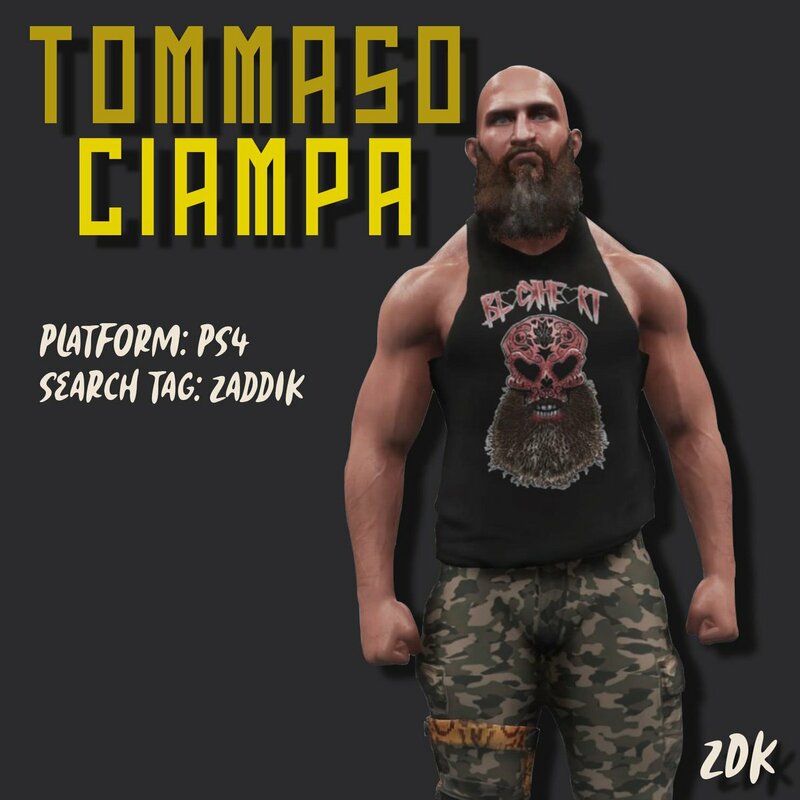 August 21, 2015 – SLA: Tommaso Ciampa defeated Zakk Sawyers. August 22, 2015 – SLA: Christian Rose defeated Tommaso Ciampa. September 3, 2015 – GFW: Tommaso Ciampa defeated Kevin Matthews. September 5, 2015 – PWX: Caleb Konley defeated Tommaso Ciampa in the 1st round. September 5, 2015 – GFW: Matt Bentley defeated Kevin Matthews and Tommaso Ciampa in a 3-way match. September 6, 2015 – PWX: Adam Page, Corey Hollis, Gunner and John Skyler defeated Moose, Shane Strickland, Tim Donst and Tommaso Ciampa. September 9, 2015 – NXT: Johnny Gargano and Tommaso Ciampa defeated Tyler Breeze and Bull Dempsey in the 1st round. September 16, 2015 – NXT: Baron Corbin and Rhyno defeated Johnny Gargano and Tommaso Ciampa in the quarter-finals of the Dusty Rhodes tournament. September 19, 2015 – RevPro: Tommaso Ciampa defeated Josh Shooter in a dark match. September 19, 2015 – RevPro: Josh Bodom defeated Tommaso Ciampa. September 20, 2015 – ICW: Damo defeated Tommaso Ciampa. September 27, 2015 – IPW:UK: Tommaso Ciampa defeated Dave Mastiff to become #1 contender for the All England title. October 2, 2015 – wXw: Tommaso Ciampa defeated Bobby Fish, Jonathan Gresham and Player Dos in a 4-way match. October 3, 2015 – wXw: Bobby Fish and Kyle O’Reilly defeated ACH and Tommaso Ciampa in the 1st round. October 4, 2015 – wXw: Michael Dante defeated Tommaso Ciampa. October 10, 2015 – SWE: Tommaso Ciampa defeated Morgan Webster. October 11, 2015 – IPW:UK: All England champion Sammy Smooth defeated Tommaso Ciampa to retain the title. October 14, 2015 – NXT: Tommaso Ciampa was in the #1 contenders battle royal for the NXT title won by Apollo Crews. October 16, 2015 – SWE: John Klinger defeated Tommaso Ciampa. October 18, 2015 – PROGRESS Chapter 22: Mark Haskins defeated Tommaso Ciampa. November 1, 2015 – XWA: Tommaso Ciampa defeated Delirious. November 6, 2015 – AAW: Tommaso Ciampa defeated Michael Elgin. November 7, 2015 – DREAMWAVE: Tommaso Ciampa defeated Stephen Wolf. November 13, 2015 – HOH X: Eddie Kingston defeated Tommaso Ciampa. November 14, 2015 – HOH XI: Tommaso Ciampa defeated Alex Reynolds and JT Dunn in a 3-way elimination match. November 28, 2015 – AAW: Tommaso Ciampa defeated Fenix. December 5, 2015 – Pro Wrestling Chaos 18: Jeckel defeated Tommaso Ciampa. December 6, 2015 – PROGRESS Chapter 24: Tommaso Ciampa defeated Zack Sabre Jr..
December 11, 2015 – PWG: PWG world tag team champions the Young Bucks defeated Johnny Gargano and Tommaso Ciampa to retain the titles. December 12, 2015 – PWG: Brian Cage and Michael Elgin defeated Johnny Gargano and Tommaso Ciampa. December 18, 2015 – AIW: Team Gargano (Brian Carson, Dr. Daniel C. Rockingham, Johnny Gargano, Joshua Singh & Tommaso Ciampa) defeats Team Candice (Alex Kellar, Candice LeRae, Evan Adams , Frankie Flynn & Kaplan). December 26, 2015 – AAW: Tommaso Ciamap defeated Michael Elgin. December 27, 2015 – Beyond Fete Finale: Donovan Dijak defeated Tommaso Ciampa. January 2, 2016 – DREAMWAVE: DREAMWAVE tag team champions Matt Cage and Christian Rose defeated Johnny Gargano and Tommaso Ciampa to retain the titles. January 9, 2016 – UIW: Chip Day and Murder-1 defeated Johnny Gargano and Tommaso Ciampa. January 10, 2016 – AWE: Tommaso Ciampa defeated Chip Day. January 13, 2016 – NXT: Tommaso Ciampa defeated Danny Burch. January 14, 2016 – NXT Live Event: Sami Zayn defeated Tommaso Ciampa. January 16, 2016 – NXT Live Event: Sami Zayn defeated Tommaso Ciampa. Tommaso Ciampa defeated Bull Dempsey. January 23, 2016 – EVOLVE 54: Tommaso Ciampa defeated Ethan Page. January 24, 2016 – EVOLVE 55: Caleb Konley defeated Tommaso Ciampa. January 31, 2016 – Beyond The Dream Left Behind: Johnny Gargano and Tommaso Ciampa defeated Dan Maff and Monsta Mack. February 5-6, 2016 – NXT Live Event: Blake and Murphy defeated Johnny Gargano and Tommaso Ciampa. February 20, 2016 – NOW: Louie Perez and Tommaso Ciampa defeated Dre Jacobs and Mountain Killer. February 24, 2016 – NXT: Tommaso Ciampa defeated Bull Dempsey. February 26, 2016 – CW: CW New England champion Brandon Locke defeated Tommaso Ciampa to retain the title. February 27, 2016 – RPW: Bobby Ocean defeated Tommaso Ciampa. February 28, 2016 – Beyond By Popular Demand: Angel Ortiz and Mike Draztik defeated Johnny Gargano and Tommaso Ciampa. March 3, 2016 – NXT Live Event: Johnny Gargano and Tommaso Ciampa defeated The Vaudevillains. March 12, 2016 – XICW: XICW Midwest champion Rhino defeated Tommaso Ciampa to retain the title. March 16, 2016 – NXT: Tommaso Ciampa defeated Jesse Sorensen. March 18, 2016 – AAW: Tommaso Ciampa defeated Jack Evans. March 19, 2016 – XWA: Tommaso Ciampa defeated JT Dunn. March 20, 2016 – Tier 1: Timothy Thatcher defeated Tommaso Ciampa to become #1 contender for the EVOLVE title. March 20, 2016 – EVOLVE 57: TJ Perkins defeated Tommaso Ciampa. March 27, 2016 – PROGRESS Chapter 27: PROGRESS tag team champions El Ligero and Nathan Cruz defeated Tommaso Ciampa and Zack Sabre Jr. to retain the titles. April 9, 2016 – AAW: Tommaso Ciampa defeated Zack Sabre Jr..
April 13, 2016 – NXT: Johnny Gargano and Tommaso Ciampa defeated The Vaudevillains. April 17, 2016 – AWE: Martin Stone defeated Tommaso Ciampa. April 20, 2016 – NXT Live Event: Christopher Girard defeated Tommaso Ciampa. April 21-22, 2016 – NXT Live Event: Manny Andrade defeated Tommaso Ciampa. April 24, 2016 – Beyond Head Over Heels: John Skyler defeated Tommaso Ciampa. April 30, 2016 – Xcite: Joe Gacy defeated Tommaso Ciampa. May 6, 2016 – AAW: Sami Callihan defeated Tommaso Ciampa to retain the AAW heavyweight title. May 18, 2016 – NXT: Johnny Gargano and Tommaso Ciampa defeated Danny Burch and Rob Ryzin. May 20, 2016 – CW: Adam Booker defeated Tommaso Ciampa. May 21, 2016 – PWX: Anthony Henry defeated Tommaso Ciampa. May 25, 2016 – NXT: Johnny Gargano and Tommaso Ciampa defeated Nick Miller and Shane Thorne. May 28, 2016 – LW: Tommaso Ciampa defeated Xavier Bell. May 29, 2016 – Beyond C5 – A Fundraiser For Brandon Watts: Matt Riddle defeated Tommaso Ciampa by disqualification. June 1, 2016 – NXT: Johnny Gargano and Tommaso Ciampa defeated Dash Wilder and Scott Dawson. June 4, 2016 – WFW: Johnny Gargano and Tommaso Ciampa defeated The Handicapped Heroes (Gregory Iron and Zach Gowen). June 5, 2016 – AWE: GWC heavyweight champion Jimmy Rave defeated Martin Stone and Tommaso Ciampa in a 3-way match to retain the title. June 10, 2016 – VIP: Keith Lee defeated Gregory James, Lou Sterrett and Tommaso Ciampa in a 4-way match. June 11, 2016 – PWM: Tommaso Ciampa defeated Ricky Martinez. June 17, 2016 – AAW: Tommaso Ciampa defeated Josh Alexander. June 26, 2016 – Beyond Ripped Off In The Prime Of Life: Tommaso Ciampa defeated David Starr. June 29, 2016 – NXT: Johnny Gargano and Tommaso Ciampa defeated The Hype Bros (Mojo Rawley and Zack Ryder). July 16, 2016 – MCW: Tommaso Ciampa defeated Jason Kincaid in the 1st round. Lio Rush defeated Jason Kincaid, Joe Keys, Sonjay Dutt, Tommaso Ciampa and Travis Gordon in a 6-way elimination match to win the Shane Shamrock Cup. July 17, 2016 – EVOLVE 65: Cedric Alexander defeated Tommaso Ciampa. July 17, 2016 – Beyond Flesh: Matthew Riddle defeated Tommaso Ciampa. July 23, 2016 – AAW: Johnny Gargano and Tommaso Ciampa defeated Andrew Everett and Trevor Lee. July 28, 2016 – NXT Live Event: Johnny Gargano and Tommaso Ciampa defeated Dash Wilder and Scott Dawson by disqualification. The Revival retains. July 29, 2016 – NXT Live Event: Austin Aries defeated Tommaso Ciampa. July 30, 2016 – NXT Live Event: NXT tag team champions Dash Wilder and Scott Dawson defeated Johnny Gargano and Tommaso Ciampa to retain. July 31, 2016 – Beyond Americanrana: Brian Fury defeated Tommaso Ciampa. August 3, 2016 – WWE Cruiserweight Classic: Johnny Gargano defeated Tommaso Ciampa in the 1st round. August 4-5, 2016 – NXT Live Event: Johnny Gargano and Tommaso Ciampa defeated WWE tag team champions Dash Wilder and Scott Dawson by disqualification. Wilder & Dawson retains the tag titles. August 6, 2016 – NXT Live Event: Dash Wilder and Scott Dawson defeated Johnny Gargano and Tommaso Ciampa to retain the tag team titles. August 20, 2016 – NXT TakeOver – Brooklyn: Dash Wilder and Scott Dawson defeated Johnny Gargano and Tommaso Ciampa to retain the tag team titles. August 27, 2016 – NXT Live Event: Johnny Gargano and Tommaso Ciampa defeated NXT tag team champions Dash Wilder and Scott Dawson in a non-title match. September 1, 2016 – AAW: Pentagon Jr. defeated Tommaso Ciampa to retain the AAW heavyweight title. September 3, 2016 – PWG: Dalton Castle defeated Tommaso Ciampa in the 1st round of the Battle of Los Angeles. September 4, 2016 – PWG: Cedric Alexander, Chuck Taylor, Jeff Cobb, Jushin Thunder Liger and Tommy End defeated Brian Kendrick, Matthew Riddle, Pete Dunne, Sami Callihan and Tommaso Ciampa. September 9, 2016 – CW: Hanson defeated Tommaso Ciampa. September 14, 2016 – WWE Cruiserweight Classic: Johnny Gargano and Tommaso Ciampa defeated Cedric Alexander and Noam Dar. September 18, 2016 – XWA: Cody Rhodes defeated Tommaso Ciampa. September 23, 2016 – DW: Joe Coffey defeated Tommaso Ciampa. September 25, 2016 – PROGRESS Chapter 36: Zack Sabre Jr. defeated Tommaso Ciampa in a best 2 out of 3 falls match. October 15, 2016 – NXT Live Event: #DIY (Johnny Gargano and Tommaso Ciampa) defeated Angelo Dawkins and Kenneth Crawford. October 26, 2016 – NXT: #DIY (Johnny Gargano and Tommaso Ciampa) defeated Ho Ho Lun and Tian Bing in the 1st round. November 9, 2016 – NXT: The Authors Of Pain (Akam and Rezar) defeated #DIY (Johnny Gargano and Tommaso Ciampa) in the semi-finals of the Dusty Rhodes Classic. December 5, 7, 11, 2016 – NXT Live Event: #DIY (Johnny Gargano and Tommaso Ciampa) defeated Riddick Moss and Tino Sabbatelli to retain the tag titles. December 8, 2016 – NXT Live Event: #DIY (Johnny Gargano and Tommaso Ciampa) defeated TM-61 (Nick Miller and Shane Thorne) to retain the titles. December 10, 13, 15, 17, 2016 – NXT Live Event: #DIY (Johnny Gargano and Tommaso Ciampa) defeated The Revival (Dash Wilder and Scott Dawson) to retain the tag team titles. December 28, 2016 – NXT: #DIY (Johnny Gargano and Tommaso Ciampa) defeated Akira Tozawa and Tajiri to retain the tag team titles. January 13, 2017 – NXT Live Event: #DIY (Johnny Gargano and Tommaso Ciampa) defeated SAnitY (Alexander Wolfe and Killian Dain) to retain the titles. April 13, 2017 – NXT Live Event: The Authors Of Pain (Akam and Rezar) defeated #DIY (Johnny Gargano and Tommaso Ciampa) & The Revival (Dash Wilder and Scott Dawson) in a 3-way tag team match to retain the tag titles. May 5-7, 2017 – NXT Live Event: #DIY (Johnny Gargano and Tommaso Ciampa) defeated Riddick Moss and Tino Sabbatelli. May 10, 2017 – NXT: #DIY (Johnny Gargano and Tommaso Ciampa) defeated Riddick Moss and Tino Sabbatelli. May 20, 2017 – NXT TakeOver – Chicago: The Authors Of Pain (Akam and Rezar) w Paul Ellering defeated #DIY (Johnny Gargano and Tommaso Ciampa) in a ladder match to retain the tag titles. After the match Ciampa turned on Gargano putting him true the tables. May 31, 2017 – NXT: Tommaso Ciampa revealed why he attacked Johnny Gargano and said that he will be out for a long time. July 3, 2017: Update on Tommaso Ciampa injury is that he suffered a torn ACL and will be out of action until early 2018. January 27, 2018 – NXT TakeOver – Philadelphia: Tommaso Ciampa made a surprise return after the Johnny Gargano match and attacked him. March 7, 2018 – NXT: Tommaso Ciampa came out to the ring but could not speak due to the crowd booing him. April 7, 2018 – NXT TakeOver – New Orleans: Johnny Gargano defeated Tommaso Ciampa in a unsanctioned match. April 20, 22, 2018 – NXT Live Event: Tommaso Ciampa defeated Oney Lorcan. April 26, 2018 – NXT Live Event: Tommaso Ciampa defeated Danny Burch. May 5, 2018 – NXT Live Event: Tommaso Ciampa defeated Raul Mendoza. May 16, 2018 – NXT: Segment between Tommaso Ciampa & Candice LeRae in which she did not recognize who he was anymore. May 23, 2018 – NXT: Johnny Gargano calls out Tommaso Ciampa. May 24, 2018 – NXT Live Event: Tommaso Ciampa defeated Mars Wang. June 1, 10, 12, 2018 – NXT Live Event: Aleister Black, Johnny Gargano and Ricochet defeated Lars Sullivan, The Velveteen Dream and Tommaso Ciampa. June 6, 2018 – NXT: Johnny Gargano returned and attacked Tommaso Ciampa. June 8, 2018 – NXT Live Event: Johnny Gargano defeated Tommaso Ciampa. June 9, 2018 – NXT Live Event: Pete Dunne defeated Tommaso Ciampa to retain the WWE United Kingdom title. June 11, 2018 – NXT Live Event: Johnny Gargano and Ricochet defeated The Velveteen Dream and Tommaso Ciampa. June 16, 2018 – NXT TakeOver – Chicago II: Tommaso Ciampa defeated Johnny Gargano in a Chicago Street fight. June 27, 2018 – NXT: Tommaso Ciampa told Aleister Black that he is coming for his NXT title. June 28, 2018 – NXT Live Event: Tommaso Ciampa defeated Tian Bing. July 14, 2018 – NXT Live Event: Tommaso Ciampa defeated EC3. 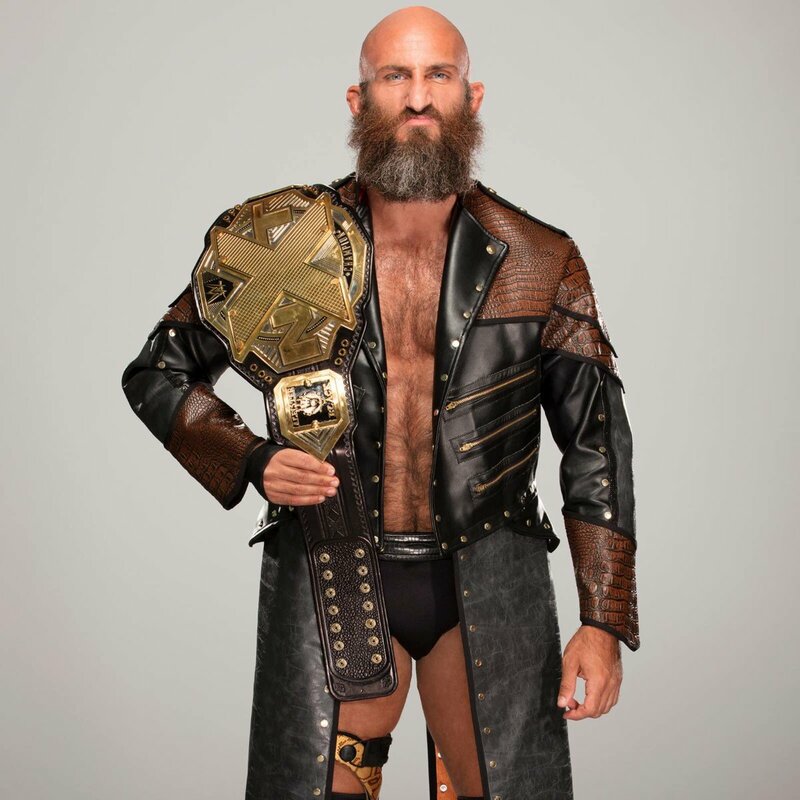 July 25, 2018 – NXT: Tommaso Ciampa defeated Aleister Black to win the NXT title. July 26, 28, 2018 – NXT Live Event: Tommaso Ciampa defeated Aleister Black to retain the NXT title. July 27, 2018 – NXT Live Event: Aleister Black and EC3 defeated The Velveteen Dream and Tommaso Ciampa. July 29, 2018 – NXT Live Event: Tommaso Ciampa defeated The Velveteen Dream to retain the NXT title. August 4, 2018 – NXT Live Event: Tommaso Ciampa defeated EC3 to retain the NXT title. August 16, 2018 – NXT Live Event: Tommaso Ciampa defeated Dominik Dijakovic to retain the NXT title. August 18, 2018 – NXT TakeOver Brooklyn 4: Tommaso Ciampa defeated Johnny Gargano in a last man standing match to retain the NXT title. August 31, 2018 – NXT Live Event: Tommaso Ciampa defeated The Velveteen Dream to retain the NXT title. September 7, 9, 2018 – NXT Live Event: Tommaso Ciampa defeated Dominik Dijakovic to retain the NXT title. September 12, 2018 – NXT: Tommaso Ciampa denies attacking Aleister Black. September 13, 2018 – NXT Live Event: Tommaso Ciampa defeated The Velveteen Dream to retain the NXT title. September 26, 2018 – NXT: NXT champion Tommaso Ciampa defeated Otis Dozovic w Tucker Knight in a non-title match. October 10, 2018 – NXT: Nikki Cross‘ revelation unsettles Tommaso Ciampa and Velveteen Dream. October 11, 13, 2018 – NXT Live Event: Tommaso Ciampa defeated The Velveteen Dream to retain the NXT title. November 1, 2018 – NXT Live Event: Tommaso Ciampa defeated Aleister Black to retain the NXT title. November 3, 2018 – NXT Live Event: NXT champion Tommaso Ciampa defeated The Velveteen Dream in a non-title match. November 9, 2018 – NXT Live Event: Tommaso Ciampa defeated The Velveteen Dream to retain the NXT title. November 16, 2018 – NXT Live Event: Tommaso Ciampa defeated The Velveteen Dream to retain the NXT title. November 17, 2018 – NXT TakeOver – War Games: Tommaso Ciampa defeated The Velveteen Dream to retain the NXT title. November 29, 2018 – NXT Live Event: Tommaso Ciampa defeated Keith Lee to retain the NXT title. December 5, 2018 – NXT: Tommaso Ciampa instigates a steel cage match between Johnny Gargano & Aleister Black. December 6, 8, 2018 – NXT Live Event: Tommaso Ciampa defeated The Velveteen Dream to retain the NXT title. January 5, 2019 – NXT Live Event: Ricochet and The Velveteen Dream defeated Johnny Gargano and Tommaso Ciampa. January 4, 6, 2019 – NXT Live Event: Aleister Black and The Velveteen Dream defeated Johnny Gargano and Tommaso Ciampa. January 23, 2019 – NXT: Tommaso Ciampa and Johnny Gargano take down Aleister Black and Ricochet. January 26, 2019 – NXT TakeOver – Phoenix: Tomasso Ciampa defeated Aleister Black to retain the NXT title. February 3, 2019 – Halftime Heat: Aleister Black, Ricochet and The Velveteen Dream defeated Adam Cole, Johnny Gargano and Tommaso Ciampa. February 7, 9, 2019 – NXT Live Event: Ricochet and The Velveteen Dream defeated Johnny Gargano and Tommaso Ciampa. February 18, 2019 – RAW: Johnny Gargano and Tommaso Ciampa defeated WWE RAW tag team champions The Revival (Dash Wilder and Scott Dawson) in a non-title match. March 6, 2019 – NXT: #DIY (Johnny Gargano and Tommaso Ciampa) defeated The Undisputed ERA (Bobby Fish and Kyle O’Reilly) in the 1st round. 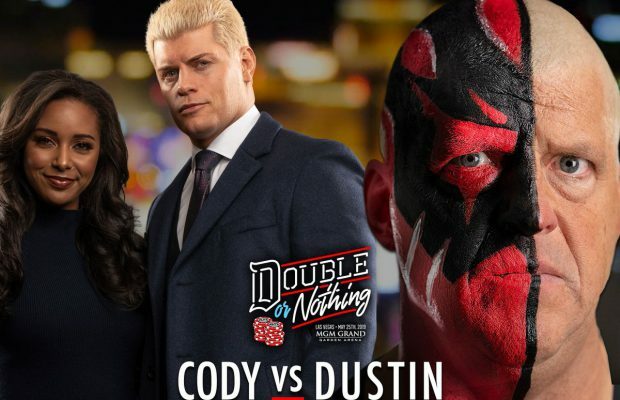 March 13, 2019 – NXT: Aleister Black and Ricochet defeated #DIY (Johnny Gargano and Tommaso Ciampa) in the semi-finals of the 2019 Dusty Rhodes tag team Classic. Johnny Gargano turned on Tommaso after the match. It has been confirmed that Tommaso Ciampa had neck surgery and will miss a unknown amount of time. The Blackheart of NXT @ProjectCiampa is Available NOW on the PS4! @barlow_sean @MikeQuackenbush @NGWrestlingUK @Butlins @EandCPod @ProjectCiampa Great shout! I’ve heard they are hilarious! From being told no at our initial tryout to last night...every surgery, setback, and heartbreak...it may not be exactly how we envisioned it but the end result remains. The NXT Universe were along for this journey since day one. It only made sense to share this moment.